A team of experts and engineers is working with surgeons step aside to develop masks which may heal the soldiers’ burnt skins. According to Wired magazine, Biomask will be the how in 2012 military soldiers will treat their burn faces. This Biomask will have regenerative elixir, actuators and sensors to use for several months, having stems cells to help recover the facial health tissues. According to US military figures, there were more than 85 percent injuries during the war which damaged the facial tissues of military soldiers and Pentagon has achieved success to produce medicines from specialists of Northwestern University, along with army institute of Surgical research and Brooklyn medical research center. According to a researcher and project leader at UT Arlington, Eileen Moss, the mask is currently in its intial phases of development but team has currently seen how this will look and work and it will give soldiers complete recovery of their phases just before the injury they had. 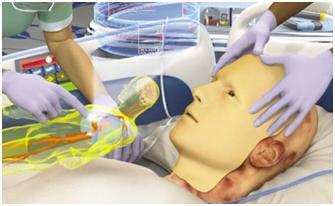 This Biomask is a powerful health gadget which will bring revolution in the medical fast treatment. This is a collaboration project in which researchers are seeking to improve burn treatment outcomes with modern electronic and refrigerating medicines for facial tissues recovery. 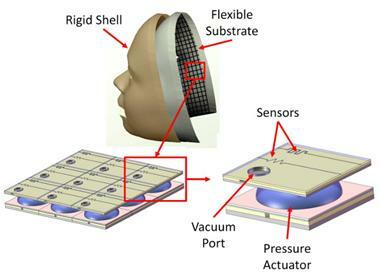 There are basically two layers of this Biomask; Upper layer is consisting of a hard shell which will project the user’s face and storing the electronic components. Second layer is a polymer mask which will fit around the facial skin, because polymer works as seal around the facial injured cells and compress them to prevent formation of scars. There are many actuators and sensors which will be embedded with this polymer shell to check the process of healing and provide accurate data to the medical operating physicians. Although this mask will itself act as treatment of damaged cells, the Biomask will bring it a step forward to feature micro tubes network, while delivering the painkillers and antibiotics to enter parts of the face skin and determine through sensors in the mask. This Biomask will bring a 24/7 treatment to the damaged skin patients and researchers are hopeful that system will bring positive changes for the recovery of burned skin. More information has been given at UT Arlington and it is expected that this Biomask will be available within next five years. Where current burn treatment involves the grafting treatment for infected areas, this new procedure of Biomask will bring much ease and fast recovery of military soldiers.